They say that “every silver lining has its cloud” and that was certainly true last week. 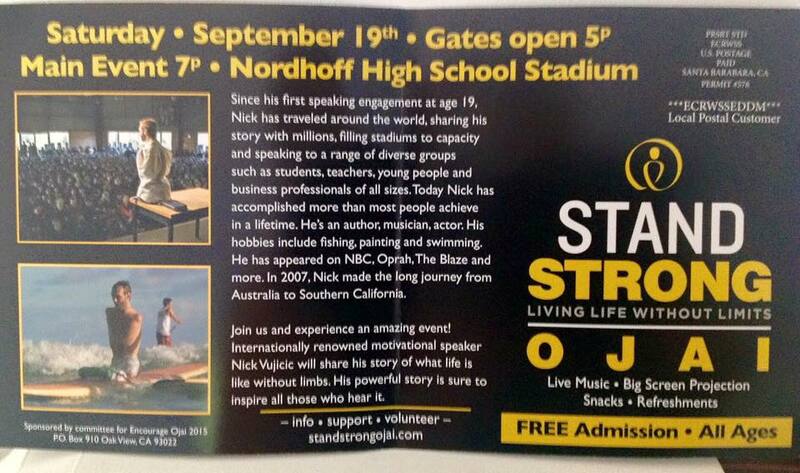 After an amazingly successful string of appearances at local schools, including two in our own District, talking about exceeding limits and overcoming bullying, Nicholas James Vujicic staged an appearance at the Nordhoff Community Stadium at Nordhoff High, and for many people, blew all that good will. What’s upsetting people? Nick’s public school appearances were inspiring, thought provoking, and most of all, non-religious. Many parents heard amazing stories about him from their kids in school, and decided to attend the Saturday evening event. Other folks attended in response to an invitation in a column in the Ojai Valley News. Still others saw this advertisement. Apparently, the event was actually more of a Christian religious function than many in the audience were prepared for. Calls on Facebook immediately issued for separation of Church and State, and “bait and switch.” There may be a little bit of validity to some of the complaints. But first, you should know the District did not pay for, host, or sponsor Mr. Vujicic or his Saturday evening event. The event promoters rented the facility from the District for the event. Almost anyone can do it. It’s the law. You should also know that the District office is getting many emails and notes talking about how significant Nick’s in-school appearances were. We are hearing stories from parents of kids opening up for the first time talking about their feelings of isolation and fear of bullying. There is no doubt in my mind that more of this kind of conversation will save kids’ lives. Mr. Vujicic’s inspiring appearances and speeches are a signpost toward more effective ways of reaching our kids, and showing them we mean it (most kids don’t think telling an adult will make any difference at all) when we say we are against bullying. Unfortunately, many attendees to the Saturday evening event expected a secular inspirational, anti-bullying speech, not a Christian evangelical revival. But apparently that’s what they felt it was. It was a free event, and no one was held there by force. Yet many felt duped or lured in under false pretences. When you look at the promo material, you can see what they’re talking about. To further confuse matters, the high school principal MC’d the event as a private citizen, which is his personal right. So, while I don’t think the District is responsible for the misunderstandings, I don’t think we can ignore them. We will continue to rent our facilities to the community, but we have a responsibility to prevent our facilities from being abused or misused. More serious is the allegation that there was inviting or recruiting in our classrooms for the Saturday evening event. Access to our students is a privilege, and may never be used as a marketing opportunity. No matter who the renter, there can never be overlap between any in-school speech or activity and outside private event. I am informed that students were told about the Saturday event, and warned that it would be different from the in-school presentations and more religious. I am satisfied that no students were “recruited” or “encouraged” to attend the Saturday event. Nevertheless, even this little bit of overlap is concerning, and will require discussion. OUSD leadership and Superintendent Bangser understand the issues in play here. As Board President Thayne Whipple has published elsewhere, we will be reviewing what occurred and learning from our experience. Here’s what we can’t lose sight of. Despite the misunderstandings, and other questions, good things happened for our students. Let’s not forget that the in-class speeches seem to have had a strong positive impact. That’s a real success. Any time you have a success, you look to see what worked, and how to repeat it. We should learn from any mistakes, but most importantly, we need to focus on how to replicate that good effect for our students.